Don Barbo is a managing director with VMG Health. 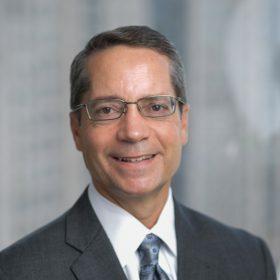 He specializes in healthcare business valuations involving mergers and acquisitions, divestitures, partnership transactions, leasing arrangements, divorces, commercial damages, and financial reporting. His extensive healthcare valuation engagements have included hospitals (acute care, long-term care, critical access, and surgical), physician practices (variety of primary care and hospital-based), ambulatory surgery centers, diagnostic imaging centers, cardiac catheter labs, pathology and clinical labs, cancer treatment centers, and dialysis centers. Mr. Barbo has also performed engagements for various contracts between hospitals and physicians, including medical director agreements, on-call agreements, lithotripsy service agreements, purchase services agreements, and management services agreements. Mr. Barbo has spoken extensively to various legal and valuation organizations and has published articles regarding business valuation issues. He also serves as an expert witness in litigated matters for his clients, including testifying before the U.S. Tax Court. Mr. Barbo has been performing healthcare valuations since 1998. Prior to his valuation career, he served as the chief financial officer for a physician practice management company that provides management services to a variety of physician practices. Before that, he served as the controller/financial officer for various emerging companies. He began his professional career as an auditor with an international accounting firm. Mr. Barbo is a CPA, holds the Accreditation in Business Valuation from the AICPA, is a member of the Medical Group Management Association (MGMA), and a member of the Healthcare Financial Management Association (HFMA). He also serves on the Technical Advisory Board for the AICPA’s Forensics & Valuation Section Consulting Digest. He holds a BBA in Accounting from Texas Tech University, and an MBA from the Cox School of Business, Southern Methodist University.